The road to “Big Apple Corner” (West 54th Street and Broadway) wasn’t easy. It took five years. Here’s what happened. The Gerald Cohen-Barry Popik work had traced “the Big Apple” to John J. Fitz Gerald, a track writer for the New York Morning Telegraph who’d heard the phrase from stablehands in New Orleans. Fitz Gerald, who was born in Saratoga, had lived the last thirty years of his life in Manhattan at a welfare hotel, then called the Hotel Bryant, at Broadway and West 54th Street. In the 1990s, the hotel was renovated and became the Ameritania Hotel. In 1992, I took all the “Big Apple” documents and asked to speak to someone at the Manhattan Borough President’s Office. The city charter changed in the late 1980s; the borough presidents offices were stripped of power and now remain largely ceremonial. I was told that there was the unpaid office of borough historian, and I had to go there first. I did. The “Big Apple” research was all news to the borough historian, whose specialty was genealogy. I told her that there were many things a borough president can do: a “Big Apple” street sign, a “Big Apple” in the pavement (like Hollywood’s stars on the Walk of Fame), a “Big Apple” day, a few press releases, contact the mayor for me, contact the mayor of New Orleans, etc. Then I waited for a reply. And I waited. And I waited. A week. A month. A year. I would never receive a written reply from anyone in the office of the Manhattan Borough President. I called the Manhattan borough historian again. She said she was ill (she died in the mid-1990s), but that she had put all the stuff on the borough president’s desk. “Ruth’s (Messenger, the borough president—B.P.) busy running for mayor,” I was told over the phone. I had tried to tell the mayor—then David Dinkins, the first African-American mayor of New York City—that the “Big Apple” had come from African-Americans. I mailed the mayor with all the “Big Apple” research. I also invited the mayor to the 1992 annual dinner of the American Name Society. The large Modern Language Association convention was being held in NYC that year, and the ANS (a member organization) dinner would have a “Big Apple” presentation, including former NYC Convention and Visitors Bureau President Charles Gillett. Mayor Dinkins’ office gave me a three-line form rejection letter that the mayor was very busy and couldn’t attend the dinner. I tried to walk into city hall. Was there someone I could actually speak to? What about honoring the African-Americans? What about our work? What about the street sign? What about a “Big Apple” plaque in the pavement? I was told that I had already received an “answer” and I should be happy with that. I walked into the mayor’s office for African-American and Caribbean Affairs (now defunct, along with several other ethnographic offices). Could anyone help me honor these people? No one responded. I sent all my papers to the city council speaker. And again, I waited. And I waited. And I waited. There would be no response here, either. I sent all my papers to the city council president (now renamed the public advocate). And again, I waited. And I waited. And I waited. There would be no response here, either. The mayor, city council president, city council speaker, borough president—no one cared. Now, admittedly, an anonymous dead black man and a white man buried in an unmarked grave is not a great voting block. But that was the point of it all. To respond because it was right, because it was seemingly part of the job these politicians are paid to do. I sent all the papers to my city councilman. And, again, I waited. And I waited. A week. A month. A year. Two years. And I wrote another letter, and I said that I’m sorry to bother everybody and all, but I’d solved “the Big Apple” and I would like some sort of human response. The city councilman finally responded, two years later! Hallelujah! I wanted a street sign? They can do that! I would have to go to another city councilman, whose district it was! Bye! I went to that city councilman’s office. I was told that I would have to go before a community board committee, then a community board, then a city council committee, then the city council, and then get the mayor’s signature. I was told to pick a name. I said that “Big Apple Boulevard” sounded O.K., and the city councilman’s office agreed. It was now 1995, a mere three years later. The Encyclopedia of New York City had just come out, with Gerald Cohen’s “Big Apple” entry. A “Big Apple” article had just appeared, at long last, in 1995 in the New York Post. The community board committee told me that “Big Apple Boulevard,” by itself, wouldn’t mean much. I agreed. I said that a “Big Apple” should be placed in the pavement. I was told that they just “didn’t do that.” (See the New York Public Library’s “Library Way” pavement illustrations at East 41st Street for how this can be done and is done elsewhere.) I said that I was trying to get a private landmarks commission to put a plaque on the private building at the site. The matter was adjourned until I presented evidence for a plaque, even though this had never been a requirement for any New York City honorary street sign. In the interim, in December 1995, Charles Gillett, the man who had revived “the Big Apple” in the 1970s with the NY Convention and Visitors Bureau, had died. About 60 days later, I presented evidence that the “Big Apple” plaque was being placed on the Ameritania Hotel building. “Big Apple Boulevard” unanimously passed the community board committee and then unanimously passed the community board. In 1996, an oval red plaque was placed on the Ameritania Hotel building at West 54th Street. The plaque was removed during hotel renovations a year later and has never been re-affixed. Then I waited. And I waited. And I called up the city councilman and ask when the next step is going to happen. There was a problem. Mayor Giuliani had outlawed the name “Boulevard” for honorary signs. Would I accept “Big Apple Corner”? I said yes, so it was back to the community board committee and the community board, this time with “Big Apple Corner” instead of “Big Apple Boulevard.” The name change was approved. And I waited some more months. And I waited some more months. And another year went by. Finally, in January 1997, “Big Apple Corner” went before a city council committee. Would I copy all my research papers for distribution to 30 council members? Would I miss a day of work? Sure, no problem! I spoke before the city council committee. It was absurd. It was just me. There was no one else “for” and no one else “against.” I was talking to city council members who didn’t know anything. Charles Gillett (who should have been honored) was dead for over a year. It passed unanimously. But I hadn’t won. Both my father and mother were dying after long illnesses. They would both be dead within about 100 days. My sister asked me why I’m doing all this for New York—what had New York done for me? I could never answer that. In February, it was signed into law by Mayor Giuliani. A mayor of New York was now signing my bill into law, even though no one from the entire office had ever spoken to me. At the signing, I mentioned that I had unsuccessfully presented the same information to David Dinkins, five years before. “So? What do you want me to do?” Giuliani said. I mumbled the rest of the way, and the bill was signed into law. About two weeks later, my father died. And then, with “Big Apple Corner” signed into law, nothing happened. Weeks went by. Nothing from the mayor or anyone. I telephoned a guy in the sign division of the Department of Transportation. “Whenever your organization is ready, we’ll put up the sign,” I was told. Organization? I don’t have an organization! I’m one guy with two dead or dying parents! I told him to set the date for May 3rd, the anniversary of the first spotted Fitz Gerald “big apple” of 1921. 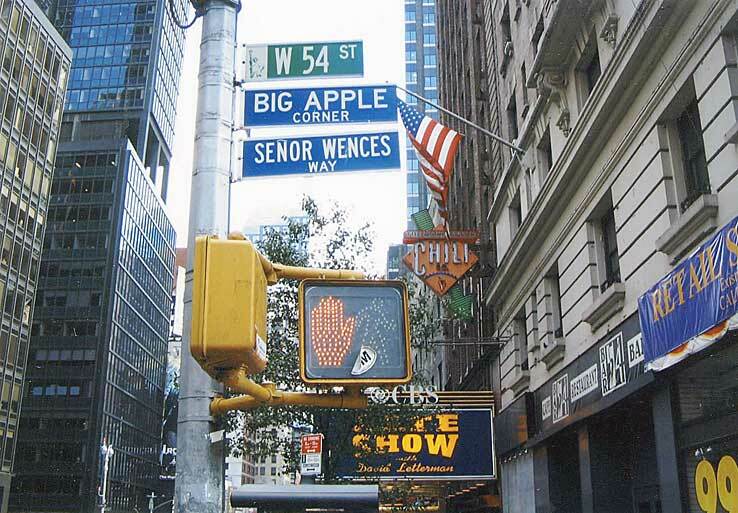 The sign would be placed just above another honorary street sign—Senor Wences Way, honoring the 100th birthday of the Spanish master who appeared often on the Ed Sullivan show. I went to the local police precinct and told them what I’d do; maybe someone would be there, maybe not. I wrote to Ric Burns, who was doing a New York: A Documentary Film for PBS. I wrote to the Times, Post, and Daily News. I wrote to the news directors of channels 1, 2, 4, 5, 7, 9, 11, and to the two all-news radio stations. I wrote to the Associated Press. I wrote to Mayors Koch and Giuliani. Koch declined. Giuliani (who had attended “Senor Wences Way") was also too busy. I e-mailed and wrote to everybody associated with David Letterman. Only the Associated Press of the media wrote back to ask me who would be there. I said that probably no one would be there. I took out a personal ad in New York magazine, asking someone to be there, because I wanted to know if someone in New York loved me. I got a call right back. Did New York magazine get the message? Maybe it would make, say, an article because the publication was called New York? “You identify yourself,” I was told. “We’re putting it in ‘Personal Services.’” So “I solved the Big Apple and I’m dedicating Big Apple Corner and I want someone to be there because I want to know if someone in New York City loves me” was dumped in a section with dating services ads. The day arrived and it was pouring rain. A cartoon drawing about it appears on “The Straight Dope” site. A policeman from the precinct showed up. “Maybe no one showed up because of the weather,” he said. I pulled the cloth and revealed the sign. Then I went back into the rain, took a train upstate to Burke Rehabilitation Hospital and reported the news to my dying mother.